Good news, Rhode Island residents! If you are strapped for cash, CashLoan.org can help you. CashLoan.org offers a quick and confidential service: take two minutes to fill out your application, and within 90 seconds the approval will come through and an hour after that the funds will be waiting for you in your account. It is that easy. There’s no need to struggle until your next paycheck; Residents in most states can take advantage of CashLoan.org’s confidential, secure and reliable service by contact us or APPLY NOW online. 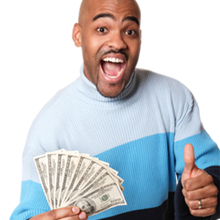 Once approved, your cash advance loan will be in your account in as little as one hour, so there's no waiting for funds. The application procedure is quick and easy, and you can get approved for a loan in as little as 90 seconds. It’s so simple. Rhode Island has laws on the book that specifically target the authorization of cash advance loans. Payday lenders to comply with the state’s small loan or criminal usury laws. Written contracts must specifically outline all of the charges and fees and be set to indicate a 14-day term limit. Borrowers may not have more than three outstanding payday loans at a time- the amount can never surpass $500. Loan terms vary - they can be anywhere from 13 to 14 days. Rhode Island law permits one extension or rollover. Finance fees cannot exceed 15% of the total amount borrowed.